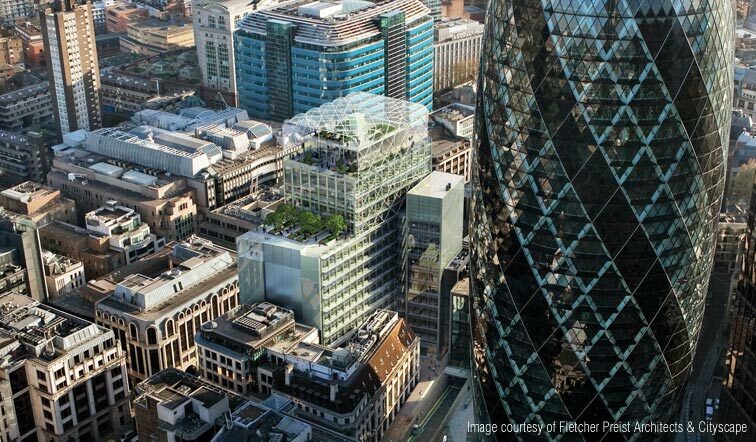 6 Bevis Marks characterises the changing City of London skyline. At the heart of the evolving financial centre around Liverpool Street station, the new sixteen storey building responds sympathetically to its neighbours, and makes a major contribution to the surrounding streetscape. The protected open roof garden is an all-year round amenity enjoying spectacular views. Waterman provided multi-disciplinary design services from pre-acquisition services, through feasibility to detailed substructure and superstructure design on this prestigious project, with our city expertise we worked closely with award winning architects Fletcher Priest and development manager CORE, on behalf of Bevis Marks Development Ltd which was a joint venture between AXA REIM and BlackRock. Structurally, an extensive suite of sampling and testing was carried out that resulted in the reuse of foundations of the existing under ream piles which provided a sustainable approach to the development. Innovative SMART foundations were adopted to monitor existing pile performance during demolition. With a new sixteen storey building erected, a steel frame was adopted to minimise dead loads which enabled the existing under ream piles to be re-used following verification sampling and testing. Rigorous analysis allowed 27% of existing piles to carry more load than previously experienced, up to a 40% load increase. The re-use enabled a 1000t carbon saving on pile installation alone. The mechanical and electrical services design provided energy efficient heating and cooling systems that minimised maintenance requirements whilst meeting the expectations and demands of a new-build commercial development. Additionally, a fully coordinated design was produced for the basement structure and services used Revit Fabrication 3D drawing package. This complex area of the building required careful consideration of the access and maintenance due to the stacking of services distribution through double height spaces and varying floor levels. The building has achieved BREEAM ‘Excellent’ as it incorporated elements such as combined heat and power generation, rainwater harvesting systems, energy saving lighting systems, condensing boilers, electronically commutated motors on fan coils and energy reclaim systems on AHU plant. All internal services are controlled by a comprehensive building management system to increase the overall energy efficiency of the building. The project has won a number of awards including winner of The Ground Engineering Sustainability Award 2013.